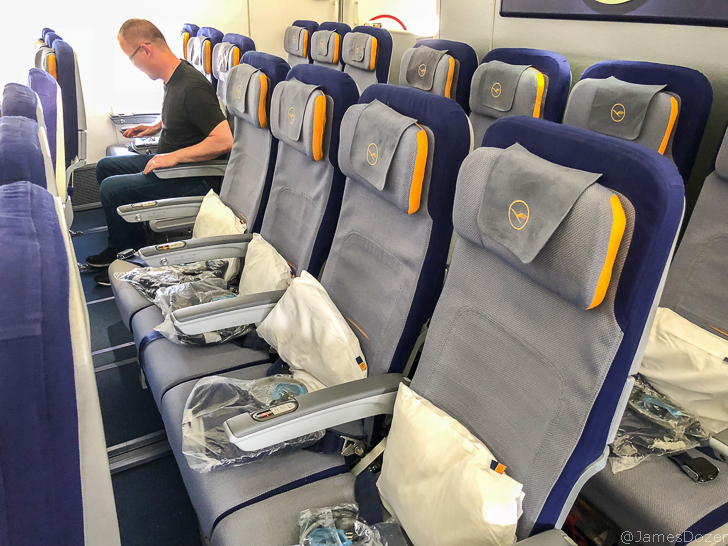 This Lufthansa Economy Class flight review from Frankfurt to Los Angeles is the final installment of my trip to Morocco with G Adventures. No benefits or perks are provided for economy class passengers but Star Alliance Gold members are granted access to the Lufthansa Senator and Business Class Lounges. 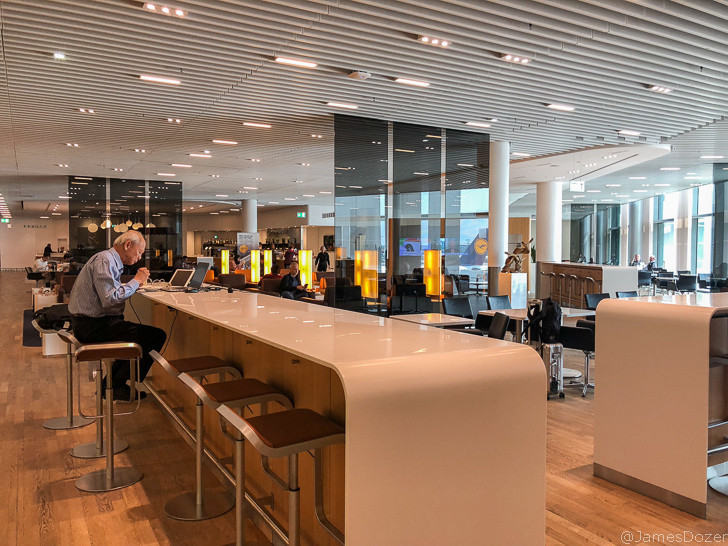 The Lufthansa Senator Lounge in Concourse Z is my favorite of all the Lufthansa lounges (minus the First Class Lounge/Terminal) and is always worth a visit before any departure. The lounge is spacious and offers the best food options and amenities for passengers. You can read my full review of the Lufthansa Senator Lounges here. I left the Lufthansa Senator Lounge about 10 minutes prior to boarding time and made my way to gate Z69. Boarding had not been called yet but people were already lining up in their respective lanes. I snapped a few pictures of the beautiful lady and then got in line with the other business class/Star Alliance Gold passengers. Boarding for our 2:05 PM flight began at approximately 1:30 PM. First class passengers boarded through door 1L and everyone else boarded through door 2L. Unlike the other aircraft in their fleet, Lufthansa’s Boeing 747-8s are configured a little unconventionally. First class is naturally located at the very front, followed by business class. However, aft of the business class cabin, there is a small economy class cabin located in front of the premium economy class cabin. The mini-economy class cabin is very private with just four rows of seats in a 3-4-3 layout and protected by bulkhead walls. Aft of the mini-economy class cabin, there is a larger cabin with both premium economy and economy class seating. As you can see from my pictures below, the forward economy class cabin is separated by two walls, whereas the premium economy class passengers share the same cabin with the economy class passengers. There is only a “floating divider” to separate the two sections but it’s fairly nominal. This premium economy class cabin doesn’t seem very premium, does it? I mean, why even bother with the floating dividers? Lufthansa charges for advance seat assignments outside of 23 hours prior to departure time. 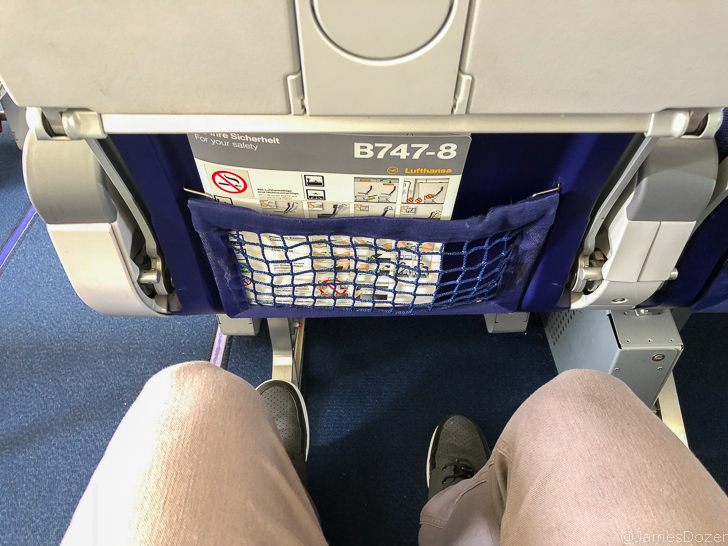 If you can pick your seats ahead of time, I would definitely pick seats in the mini-economy class cabin over the main cabin. This cabin was quieter, offered more privacy and had less foot traffic than the main cabin. These economy class seats provided 17.3 inches of width and 31 inches of pitch. I’m not gonna lie. It was kind of a tight fit. 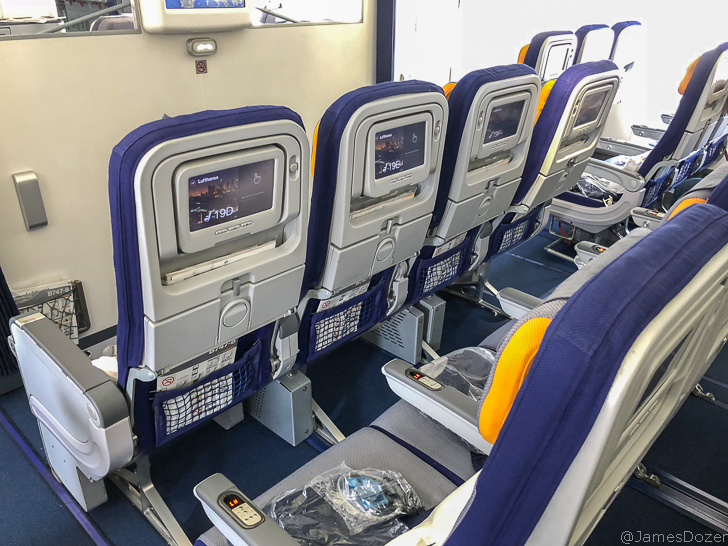 Each seat was equipped with a personal in-flight entertainment system, overhead reading lamp, coat hook and an electrical outlet underneath the seat (1 per 2 seats). Unfortunately, there were no USB ports or personal air vents outfitted on this aircraft. The IFE controls were located on the armrests, which I found incredibly annoying as my elbow kept pressing the call button or changing entertainment channels. 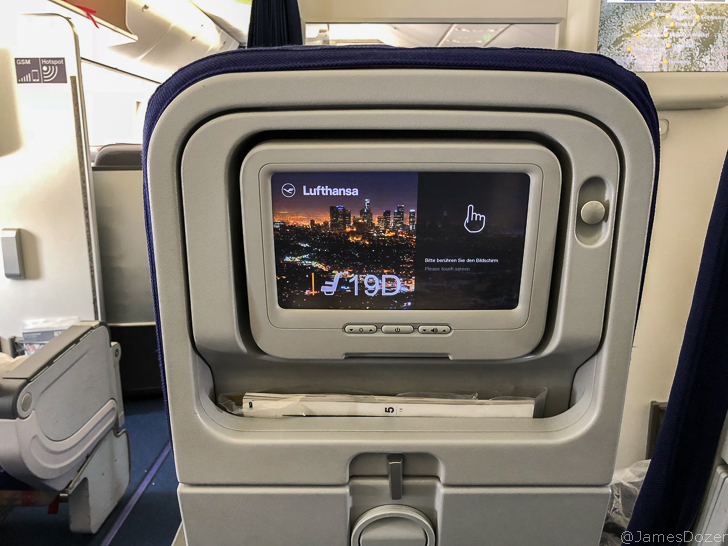 Entertainment-wise, the Lufthansa World entertainment system was loaded with a decent selection of Hollywood, European and Indian/Bollywood movies, TV shows, video games and music entertainment. Additionally, you can watch live TV (CNN, Euro news and sports) or zone out with the flight map and aircraft camera. The entertainment provided wasn’t the most robust collection but it kept me entertained enough for the 11-hour flight. On this flight, I was seated in seat 19D, an aisle seat located in the center of the forward economy class cabin. I did not pay to select my seat in advance. Waiting at my seat were a pillow, blanket and a set of cheap plastic headphones. The overhead bins were large and spacious but the seatback pockets were rather disappointing. You will have a hard time securing anything larger than a small MacBook Air or tablet in the seatback pocket. As the final passengers were boarded, the Captain came on the PA to make his welcome announcements. He welcomed us on-board, advised us of a slight delay and provided us with our estimated flight path and time. We then pushed back from the gate and made our way to the runway for our flight to Los Angeles. Once we reached our cruising altitude, the seatbelt signs were turned off and the crew prepared for our meal service. A flight attendant came by with hot towels to freshen up, followed by a beverage service and a package of salted pretzels. I’m a big fan of these bi-fold trays and cupholders. They allow you to securely hold a drink in place without having to fold out your entire tray table. Approximately 45 minutes into the flight, the flight attendants came down the aisle with our main meal. No menu cards were handed out and no further description of the dishes was provided other than “chicken or pasta.” Having enjoyed the chicken dish on my outbound flight, I ordered the same again. The chicken was served with polenta and vegetables, along with a side salad, bread roll, and a strawberry cake dessert. Lufthansa has really stepped up their catering and this chicken dish was fairly tasty. The chicken was tender and had a nice flavor to it. Good job, Lufty! Service-wise, this economy class crew was completely different than my outbound crew. The meal service was quick and efficient and they came around several times to refill drinks. They were friendly and attentive and also walked the cabin several times mid-flight with trays of water and juice. After my tray was collected, I checked out the lavatories to see if they were any different than other aircraft. They weren’t. However, I did find this very odd looking “door.” Can someone tell me what this is?? From the front, it looks like a lavatory door but it’s clearly not. WiFi was provided on this flight and it was decently priced. I paid for the flight pass and used it for a majority of the flight. Speeds were decent for working and surfing the internet and service was only unavailable once (that I noticed) somewhere over the Northwestern Passages. After a quick pass of the duty-free cart, the cabin lights were dimmed and the window shades were asked to be lowered. I wasn’t tired at all so I did some work on my laptop, watched a couple of movies and surfed the Internet for a bit. Comfort-wise, these seats were not bad. They were a little tight in the shoulders but did offer a nice recline of approximately 4 inches. The adjustable headrest was great in supporting my head but a footrest would have made the flight significantly more comfortable. In case you were wondering, the forward economy class cabin is located directly over the wings. If you enjoy a good window view, just know that you’re gonna get all wing, all day. Whereas, the view from a little further back is much better. In between meals, water, juice, candy and leftover bread were available for self-service in the galleys. And about halfway through the flight, a “snack” service was provided. It was less of a snack and more of a beverage service with candy, which was already provided in the galleys. It wasn’t anything more than what you could have gotten yourself. About two hours prior to our arrival into Los Angeles, the cabin lights were turned on and a second dinner was served. This time, there was a beef or pasta option. I went with the beef, which was served with mashed potatoes and vegetables, a bread roll and a caramel flan dessert. The beef wasn’t the best but it wasn’t bad either. Overall, this was a better than average flight experience with Lufthansa Economy Class. The forward, mini-economy class cabin provided a quieter and more private economy class experience and the food wasn’t half bad. The service was attentive and the in-flight entertainment had enough entertainment to keep me occupied the entire flight. Other than the tight seating, I really didn’t have any complaints about this flight. Have you guys flown Lufthansa Economy Class lately? If so, please share your expereinces with us in the comments section below. Thanks for reading!